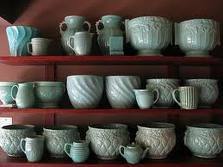 I found this picture of Martha Stewart’s amazing collection here. This one is the only one actually home to a plant. The colour combo of my newest planter reminds me of this kitchen featured recently on Apartment Therapy. I love, love, love this kitchen. So gorgeous. Thanks, Apartment Therapy, for this gorgeous inspiration! I found this picture from Apartment Therapy here. 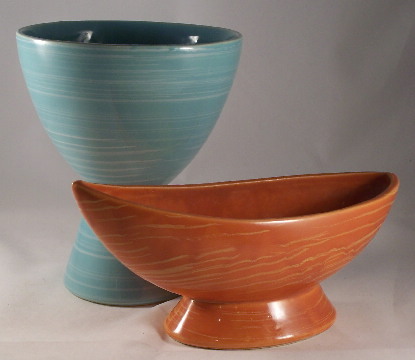 McCoy Pottery is really varied. There are different kinds of pieces (cookware, bowls, vases, lamps) and many, many different styles. 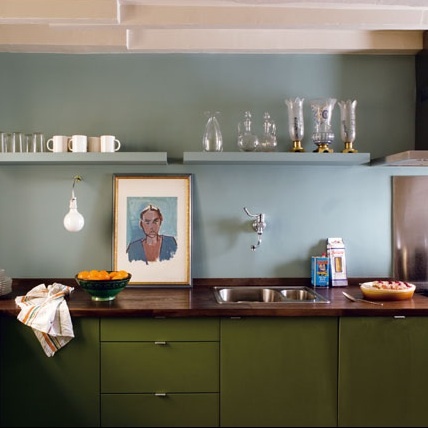 I love the mid-century cool “Harmony” line featured on this blog. For more info, there are plenty of books on collecting McCoy and here is a great website. Anyone else collect McCoy Pottery or have a different kind of pottery collection? I think you're pretty wise not to buy online: I find, it can be so hard to judge colors. Plus, by hunting locally, you'll remember the circumstances behind every piece! I too love McCoy pottery! I especially like the older pieces with simple lines and form. I have three collections: green, aqua, and white, and love amassing them together for a bold impact. Thanks for sharing your collection!